MASH 49 will start at 1400 (2:00 P.M.) so try to arrive by 1330!!! By Car: Locate The Olympic Park (East Seoul, south of river). Duchon-dong station is on the same main road as Olympic Park subway station. So drivers just need to drive South or North of Olympic Park subway station (depending on the direction you are coming from). Duchon-dong station is right next to an intersection. Note: There is a Dunkin' Donuts on one corner of the intersection. Turn into the street away from Dunkin' Donuts and you should be driving towards the golf driving range. Follow map once you locate station and intersection. Parking is limited so this would be a good MASH hash to use the subway to get there and back!! By Public Transportation: Take subway line #5 to Duchon-dong Station (# 554)(Some maps may show 549? ), take Exit # 1, Walk to the nearest street and then turn right in direction of golf driving range (approx 700 meters). You might cross one intersection enroute to the golf driving range. Turn right again opposite the golf driving range (see map). 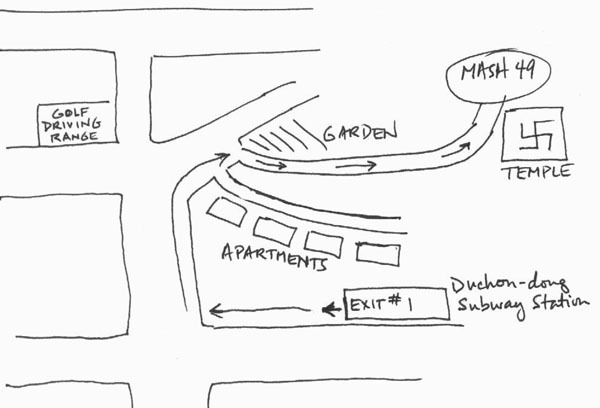 Take the 2nd right fork onto a side street/driveway with "Market Gardens" on your left. MASH 49 venue is approx 500 meters up the road opposite a temple. You can leave a bag and any post-hash goodies you might have brought to share in a car while hashing. If you get lost, call Fuzzy at 018 850 1798 or Steve at 019 814 0973. There will be a grill! We will also have the usual chips, snacks, and drinks!